PT-DW10000 provides bright, vivid images in the main auditorium. "Instantly from day one, people noticed that the room (auditorium) was different. ...it was brighter, crisper, the color - all of that was just so much, it was such a step up from what we had before." That being said, it was time to update the projectors in the conference rooms of the Moffitt Cancer Center in Tampa, Florida. The original projectors couldn't meet the requirements of the staff and board members, something the center found quite disappointing. "At the heart of everything were the projectors," said David Stringfellow, Coordinator of AV Technology at the center. "It's that important to the doctors that the quality of the image be accurate." 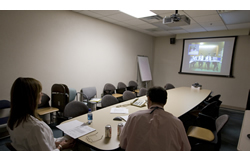 The challenge was to find and install high-performance projectors to satisfy the Moffitt Cancer Center's staff, while improving the ability to videoconference with physicians at remote locations. The ability to build a network of projectors that could seamlessly be operated from one central command center was vital to the center's operation. Jake Gilray, Sales Engineer of AVI-SPL, says the side-by-side comparison was no contest. Panasonic projectors were an instant hit with his customers at Moffitt. "It was brighter, crisper, the color - all of that was just so much, it was such a step up from what we had before," said Stringfellow. Almost immediately, the center began installing Panasonic projectors throughout its research and patient-care facilities. The projector in the main auditorium was significantly upgraded to a Panasonic PT-DW10000 with full high-definition capability and Panasonic's BriteOptic™ Quad-lamp System for 24/7 continuous operation and reliability. PT- DW10000 looking out into the auditorium from the projection room. The Horizontal/Vertical Lens Shift Technology of the PT-FW100NT was ideal for the variety of boardrooms located in the center's four buildings. PT-D5700 in the boardroom help board members make important decisions. "They have one central device that allows them to control all the media, and Panasonic, with this device, allows us that freedom. We say it doesn't matter what you bring in, we can handle it. And with the help of Panasonic, we can," said Stringfellow. 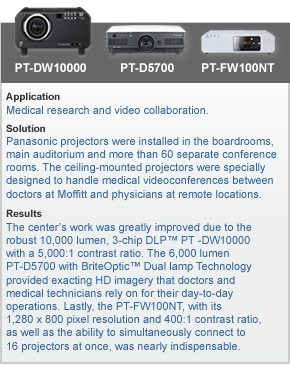 "Panasonic projectors were an instant hit with Moffitt."